Beading Arts: Focal fear? No worries! Have you ever shied away from buying a gorgeous focal bead because you just didn't know quite what you'd do with it? What was the problem? I'll bet it was something to do with color selection! Artisan focal beads often include challenging color combinations that make us hesitate. 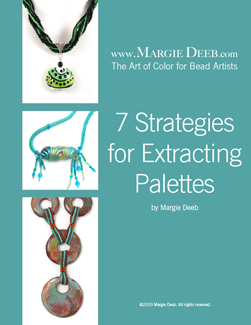 I created 7 Strategies for Extracting Palettes to address this critical issue for bead artists. It provides 7 color and design approaches to making jewelry and beads for existing beads and palettes. From one-color cabbed stones, to multi-colored fabric or focal beads, there's a strategy listed to guide you to great jewelry making. Fire up your creativity and boost your confidence in choosing and applying the perfect colors. ($3.95 digital download).